Contains beta-carotene (provitamin A), a precursor of vitamin A.
Optimises vision, growth, bone development, reproduction and the immune system. Indicated for treating or preventing a number of diseases (cataracts, breast cancer …). The dietary supplement Carottol™ is formulated to provide an optimal intake of carotenoids including the famous beta-carotene, often described as a provitamin A. These natural carotenoid pigments are known both for their yellow-orange colour and their many health benefits. To date, more than 600 carotenoids have been identified in living organisms, including several families such as the carotenes and xanthophylls. Unlike algae, green plants, and certain fungi and bacteria, humans are not able to produce carotenoids and we therefore have to look to external sources to obtain carotenoids’ benefits. This is why Carottol™ has been formulated to combine several carotenoids in a single capsule. It contains beta-carotene, lycopene, astaxanthin, lutein and zeaxanthin, all of which have been widely-studied for their health properties and uses. The orange-coloured carotenes exist in various forms, the main ones being alpha-carotene and beta-carotene. The latter is the most common form found in Nature. Studies on beta-carotene have demonstrated its high antioxidant potency and consequent ability to combat oxidative stress and free radical-induced damage. It is also a precursor of vitamin A which is why it’s often described as a provitamin A. Like all vitamins, vitamin A is essential for human health, contributing to bone formation and synthesis of eye pigments. Unfortunately, however, deficiency can occur. Supplementing with a provitamin A, which once ingested is converted into vitamin A, is often recommended to prevent or correct such a shortfall. Part of the xanthophyll family, the yellow pigments lutein and zeaxanthin are found in several foods such as egg yolk and corn. They are concentrated in the macula, a small area of the retina, where they offer protection by filtering UV and certain blue light rays. This protective effect helps minimise damage to the cells responsible for capturing light. Studies thus suggest that supplementing with xanthophylls offers anti-ageing effects, helping to prevent age-related degeneration in the retina. Lycopene is a red pigment found in tomatoes and other red fruit. Of the hundreds of carotenoids identified, lycopene is the most abundant in the human body and is also considered to be one of the most powerful. Lycopene indeed offers significant antioxidant potency and is thus able to neutralise molecules involved in oxidative stress. Being fat-soluble, it is particularly effective at eliminating free radicals that form in the body’s lipid regions. This is also the reason why this carotenoid has attracted scientific interest. Several studies suggest that lycopene supplementation reduces the risk of cardiovascular disease, diabetes, osteoporosis and some forms of cancer. Astaxanthin is a pink-to-red pigment found primarily in crustaceans and fish such as salmon. Like lycopene, astaxanthin is also recognised as being a powerful, natural antioxidant. Its anti-ageing effects come from its ability to protect against cellular ageing. Astaxanthin supplements are often used to protect the skin and eyes from UV radiation. The carotenoids supplement Carottol™ delivers the many health benefits of these natural pigments - optimising vision, growth, bone development, reproduction and the immune system. It is thus indicated in the prevention or treatment of several diseases including those affecting the eyes. And because of beta-carotene’s provitamin A role, it can also be recommended for correcting deficiency in vitamin A. This supplement comes in the form of capsules in order to maintain the quality of its active principles, including provitamin A. Each capsule contains 6750IU of carotenes, 1.8mg of alpha-carotene, 3.6mg of beta-carotene, 2mg of lutein, 1mg of zeaxanthin, 2mg of lycopene, and 1.5mg of astaxanthin. This optimal strength means the recommended dose for this supplement is 1-2 capsules a day, to be taken with food, though this dose can be adjusted in line with your needs and the advice of your therapist. In addition to this natural carotenoid complex, you may also be interested in our new multivitamin formulation Daily 6® which combines more than 50 ingredients in a single capsule. 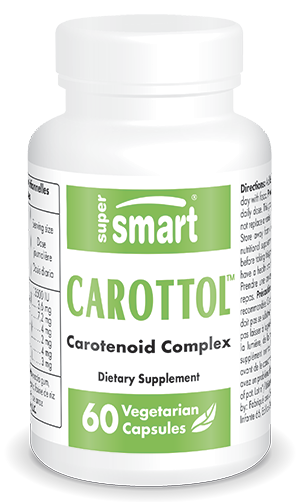 Carottol™ - Health Freedom Nutrition, LLC. Take 1 or 2 capsules at mealtimes.